What is precisely this “Mind” we talk about so frequently? For most of us mind is that which produces thoughts – our thinking equipment. Modern psychology of Freud has perceived a dark subconscious mind behind the surface conscious mind, containing all the impulses which are suppressed by the conscious mind. And the psychology of Jung has perceived a more luminous “unconscious” which contains all the psychological arch-types and regarded as a source of all our religious aspirations and impulses and also artistic creativity. There is a truth behind all these modern conceptions. However modern psychology is still an infant science groping in surface layers of the mind. The Indian masters of the science of consciousness provide a deeper view into the nature of the mind. According to ancient Indian psychology our human mind has three layers. The first one is the most primitive layer of the mind, which is the primal mind-shift, called as Chitta. Mostly subconscious in its operation, Chitta receives and stores passively all the impressions we receive through our sensations. Second is the Manas, sense-mind, which is that part of the mind which sees, hears, smells, touches, and feels through our physical sense-organ. According to Indian psychology-which is testified by the experience of many Indian yogis- this Manas, sense-mind, can work independently of the physical organs. This is because the essence or origin of our senses in not in the physical organs but in the mind, Manas. So, in Indian psychology mind or Manas is called as the “only sense” which can potentially see, hear, smell and touch without the corresponding physical organs. This potential in our mind can be made actual through a systematic and conscious discipline by which Manas detaches itself from its physical sense organs and functions independently of them. The third layer of the mind is Buddhi,, the thinking, discriminating, rational intelligence which we normally associate with the idea of mind. But in this Indian perception, Buddhi is only one layer of the mind and the highest part of it in our present condition of evolution. In an evolutionary perspective, we may say Manas is the more conscious and developed evolute from Chitta. There is perhaps some form of Chitta even in the plants but they don’t have the Manas. Animals have a Chitta as well as a well-developed Manas. The Buddhi, which belongs to humans, is a still more conscious and developed evolute from Manas. We humans have a Chitta, Manas and Buddhi. These Indian perspectives provide a broader vision of the mind than modern perceptions. The integral psychology of Sri Aurobindo and The Mother provides a still more comprehensive vision. According to this integral perspective mind pervades our entire human organism. There is a physical, vital and thinking mind. The physical mind is the mind of our physical organism or the body; it is this physical mind which determines the character and temperament of our physical being like for example capacity for endurance. Ayurveda, Indian system of medicine, classifies human body into three categories and describes them in terms of physical as well as psychological qualities. The vital mind is the mind of our sensations, emotions, vitality and dynamic faculties of actions. The Manas of Indian psychology is part of the vital mind. The thinking mind is the Buddhi of Indian psychology. In this integral view, the rational intelligence, Buddhi, is not the highest level of mind. Beyond or behind the rational and analytical intellect at the surface levels there are deeper, higher, and more intuitive layers of mind. There is a subliminal mind behind our surface mentality with a much greater capacity for intuitive knowledge, which can perceive invisible forces behind outer appearances. We must note here that the subliminal of integral psychology is not the same as the subconscious of Freud. Subconscious is beneath or below the conscious mind; it is a dark infra-rational part of our mind made of instincts and repressed impulses. Subliminal is behind our conscious or waking mind. It is something much more luminous than the conscious mind, more akin to the “Unconscious” of Jung than the Subconscious of Freud. Above the Buddhi, there are many levels of intuitive mind with a more or less direct insight into the spiritual realms of consciousness and as a result penetrate into a source of higher knowledge which the rational or scientific mind can not reach. This greater knowledge is that of the spiritual thinker, seer or sage who can perceive or see with an inner vision the hidden truths, invisible forces and the universal laws and principles of life. We must note here that this higher knowledge is not confined to religion and spirituality; it can perceive the hidden realities of life as a whole and every aspect of life and therefore has a deeper understanding of the secular and worldly life than the one who lives in his intellect. But how can such spiritual intuition of the seer and sage can be regarded as part of mind? To answer this question we have to understand the nature and source of mind as it is conceived in integral psychology. In this integral vision our human mind made of Chitta-Manas-Buddhi, is in its source, a partial, limited and imperfect expression of an infinite and perfect consciousness. This is probably the reason why in Indian psychology, the mind-stuff is called Chitta. Chit means consciousness, Chitta means “of the nature of consciousness”. The basic stuff of our human mental equipment is based on a consciousness of division pivoted around the limited, bounded, divisive awareness of the Ego which sees itself and everything in the world as distinct and separate entities. The main process of its working is through logic, reasoning and analysis; it may try to arrive at some understanding of unity through a process of mental synthesis, but what it gets is only an abstract concept of unity and not a living experience of it. The intuitive mind escapes from these limitations of the rational mind, not entirely, but only partially. It can perceive the underlying unity behind the phenomenal diversity with a much more inner concreteness, as an insight, vision or a living experience. But even in the intuitive mind, the basic nature of the mind-stuff, that of division, may persist in its outer nature and action. This is probably the reason why Sri Aurobindo calls even these intuitive faculties which can perceive spiritual truths as “spiritual mind”. They represent the spiritual potentialities of our human mind, awakened in a small minority of seers, saints and yogis, but unmanifest in the larger human mass. This consciousness of divisions disappears entirely only in the supramental consciousness of the spirit, where unity-consciousness is not an acquired potential in the divisive consciousness of the mind, but intrinsic to the very nature and substance of its being. The intuitive mind lives and acts in the consciousness of division with the unity-consciousness in the background, illuming and inspiring its thoughts and feelings and actions, and correcting the errors of the divisive mind. But the supramental consciousness lives and acts in and from the unity-consciousness which is intrinsic to its nature, in total identity with it. are you the usage of? Can I get your affiliate hyperlink on your host? 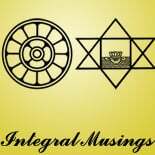 This entry was posted on July 6, 2017 by integralmusings in Religion, Spirituality & Philosophy.